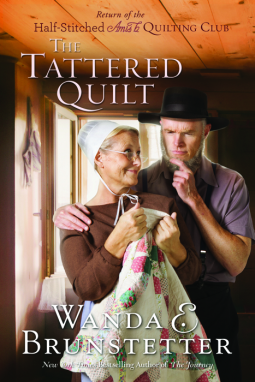 The Tattered Quilt by Wanda Brunstetter is the book I would like to share with you today. The main characters, Lamar and Emma are planning on spending the fall in Florida to escape the cooler weather of Indiana. However, the last-minute registrations in their 6-week beginner quilt class changes their plans. The six “students” for this session will bring about many challenges for the couple. Stella is an older lady that has too much time on her hands. One of her neighbors, Jan, who participated in the quilt class himself, decides this is exactly what she needs and signs her up. Anna is an Amish teen that is trying to find her way. She would like to experience things outside of her community before she makes a commitment to the church. However, her parents are holding her so tightly she can hardly breathe. Carmen is a reporter from California that has been sent to Indiana on assignment. She is supposed to get the information on the rumspringa that teens in the Amish community participate in. The quilt class seems to be the perfect vehicle to get inside information. Cheryl happened upon Emma when she was needing someone to repair her dear grandmother’s quilt. Signing up for the class seemed to be a perfect way to connect with her aging grandmother. But will the quilt hold an additional mystery? Blaine is in the class against his will, so to speak. He lost a fishing bet with a friend, who also participated in the quilt class. Blaine would much rather be wetting a line than sitting inside stitching. Terry is a roofer, who is working on a project for Lamar when he sees Cheryl walk in for the quilting class. Suddenly, he feels the desire to learn to quilt. The eclectic group of students will make for an interesting six weeks to say the very least. Will Lamar and Emma be able to break through the barriers and help each of these students work through their personal issues and move forward? This was a delightful book that I would definitely recommend. I loved how Wanda really developed the characters and how the stories we intertwined. I will be adding this author to my favorites list for fiction.